Spectacular buttes as high as a 70-story building rise from the desert floor in Arizona, as do majestic spires and mesas. The best times of the day for sightseers and photographers are early morning and late afternoon. The sun's low-angled rays intensify the shadows and red hues of the scenic rock formations. If possible, enter the Monument Valley Tribal Park when it opens (8 a.m.) to see the reddish sunrise effect on the rocks. Or stay overnight inside the park (see accommodations section on page 2). The morning view of the same butte will look markedly different than in the afternoon light. Try to see the major ones at both times. View them (see photo) from the Visitor's Center. This spire resembles its namesake and soars 125 meters (400 feet). 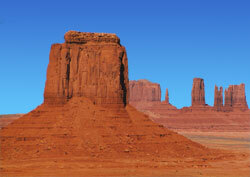 You can take a self-guided private tour in your car – or a Navajo Indian guided tour in a 4-wheel vehicle. I recommend that you take the latter because it goes places where private cars are prohibited – and your guide will explain Navajo culture. The self-guided tour takes 2 to 5 hours, depending mainly on how long you linger at the scenic viewpoints. Most guided tours last about 4 hours, though longer ones exist. Some roads are paved, others are dirt/gravel surfaced with bumps galore. Horseback trips and flight-seeing tours are also available.